We have talked recently about the upcoming arrival of BBM on to the Android and iOS platforms. Maybe as an indication of the general lack of direction and confusion around the BlackBerry and BBM brand at the moment, a bizarre sequence of events has played out over the past twelve hours. This strange sequence afects the Samsung BBM release date, as well as a proposed Samsung period of exclusivity. Firstly, Samsung posted a tweet that seemed to confirm the rumour that they had bagged a 3 month period of exclusivity around the new BBM for Android app. 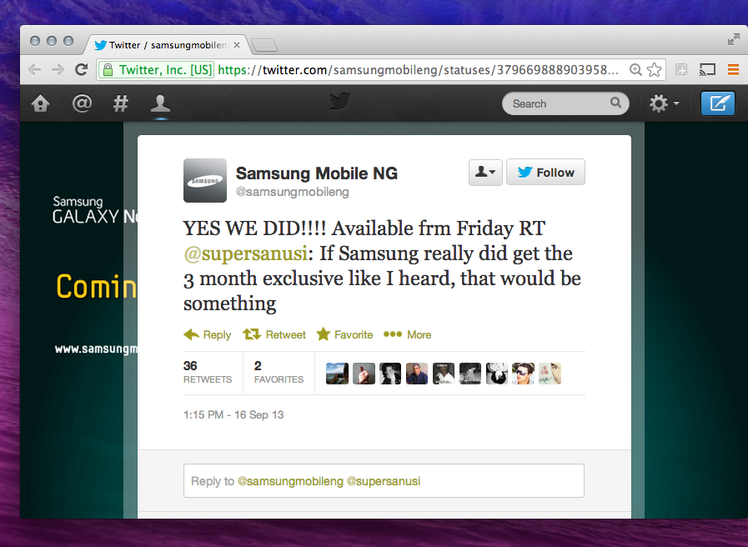 Posting via the @SamsungMobileNG account, Samsung retweeted a message questioning the rumour with a confirmation. They also claimed that the new Samsung exclusive was set to launch as early as this friday. Its originally believed that BlackBerry had hoped to launch BBM onto iOS and Android as long ago as June, but a series of delays have beset the project. For one, Apple have taken an eternity to approve the app for the app store. Maybe its intended as one last dig at their once great rivals, or maybe the app store is genuinely inundated with new apps and Apple refuse to compromise, but either way Blackberry have endured a long and no doubt highly frustrating wait for the apps approval. What BlackBerry have now confirmed is that there will be no period of exclusivity for the new app.